Gold Prospectors Association of America: Catch the fever at the GPAA Gold & Treasure Show March 24-25 in Salem, Oregon. Spiking gold prices are sometimes the deciding factor to turn off the TV and actually go gold prospecting to experience it for yourself. A quarter-ounce or pennyweight of gold is worth a lot more now than it used to be. 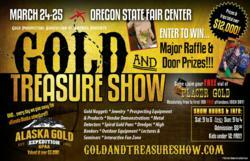 The Gold Prospectors Association of America will hold its Gold & Treasure Show March 24-25 in Salem, Oregon. The show will feature mucking and gold-panning contests as well as seminars led by Tom Massie, host of “Gold Fever” on the Outdoor Channel, or guest speakers. With the price of gold spiking to record highs in 2011, GPAA President Brandon Johnson said gold fever is definitely rising and memberships to the organization have shown substantial growth over the last year. “Spiking gold prices are sometimes the deciding factor to turn off the TV and actually go gold prospecting to experience it for yourself. A quarter-ounce or pennyweight of gold is worth a lot more now than it used to be,” Johnson said. “Prospecting isn’t necessarily all about having the gold. It’s as much about finding it,” he said, adding that for many members the thrill is enjoying the outdoors with family and friends. The Gold & Treasure Show in Salem will feature vendors and displays of gold nuggets, jewelry and prospecting equipment such as metal detectors, drywashers, spiral gold pans, dredges and highbankers. Showgoers over 18 years of age will get a chance to win a two-week Alaska Gold Expedition trip to GPAA’s famous Cripple River gold prospecting camp near Nome, Alaska. The event will run Saturday, March 24 from 9 a.m. to 5 p.m. and Sunday, March 25 from 9 a.m. to 4 p.m. at Oregon State Fair, 2330 17th Street NE, Salem OR 97303, Columbia Hall. Admission is $5. Children 12 and under admitted free. The first 100 paid attendees will receive a free vial of placer gold. Tickets are available at the door. To pre-register online and get in free, go to http://www.goldandtreasureshows.com. To find out more about gold prospecting, gem and treasure hunting or how to contact a local GPAA chapter in your area, visit http://www.goldprospectors.org or call (800) 551-9707.